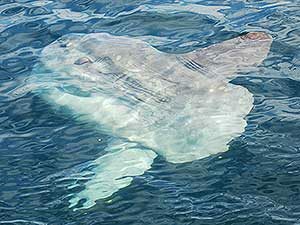 Giant Ocean Sunfish get their name from their leisurely hobby of sunbathing. Guinness World Record Holders! Sunfish hold three world records for their size, growth rate, and reproduction. Heavy Weights! Sunfish are the world’s heaviest bony fish reaching almost 5,000 lbs in weight and over 10 feet in length! Champion Body Builders! Sunfish are also the world champions of vertebrate growth. From the time they hatch as little baby fish to full grown adults, their weight increases by over 600 million times! A Parasite Hotel! Sunfish are home to over 40 different species of parasites! Leading the Lonely Life! While sunfish swim in schools as juveniles, as adults they spend most of their time by themselves. However, Monterey Bay is one of the few places in the world where Mola molas congregate in large numbers! Oh, Baby! Female sunfish hold the record for the greatest number of eggs of any vertebrate. One female, at 4 feet long, had over 300 million eggs! At full size sunfish can reach 10 feet long, imagine how many eggs a sunfish that size would have! Watch local marine scientist, Tierney Thys, talk about her research on tracking the giant ocean sunfish as it swims through the ocean!